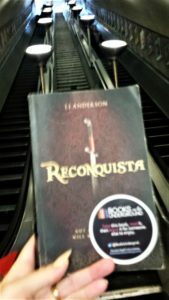 Yesterday was Indie Book Day for Books on the Underground and ‘Reconquista‘ was one of the books. 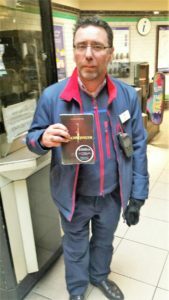 So I was out and about spotting the ‘hidden presents’ deposited by the Book Fairies, which is why this post is a day late. 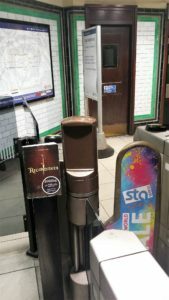 You may have visited those parts of the tube system upon which ‘Reconquista‘ was placed via Books on the Underground web-site or via their accounts on Twitter @BooksUndergrnd , Tumblr , Instagram and Facebook. I have also been tweeting @jjstorybazaar using the hashtag #reconquistaonthetube and BotU has been re-tweeting. Unsurprisingly I’ve been around the south London section of the Northern and Victoria lines near where I live, including leaving copies of ‘Reconquista‘ at Clapham Common and Clapham South and Stockwell. 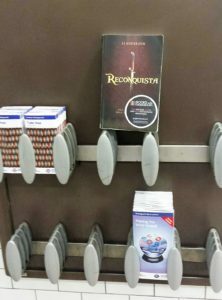 Though the Book Fairies left copies at other stations, none of the photographs of their copies of ‘hidden’ ‘Reconquista‘ had station signs in them, so I couldn’t tell how far ‘Reconquista‘ reached. For those of you who haven’t seen the tweets – an interested London Underground guard was happy to help at Clapham South ( left ). We talked about history in general and historical writing in particular. He was most illuminating about the history of the tube system and I learned about the ‘link’ tunnels between the used tracks. There’s one which goes all the way from Clapham to north London. 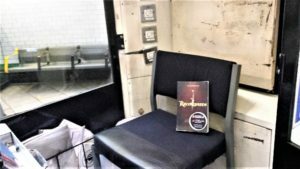 My photography was certainly not as expert as the Book Fairies’ was, but I was at my local stations, so got to place books where they may not usually go, like in the ticket inspector’s booth, right. London Underground employees no longer use these booths and most ticket offices have been closed, to the consternation of both the staff and the travelling public, but this one was opened just for ‘Reconquista’. Folk were curious when I was taking my photos. Who was this batty looking middle-aged woman taking pics of a book? Books on the Underground has been going for a few years now, but travellers in south London didn’t seem to recognise the logo and the stickers. I found myself explaining what it was all about. The odd thing is, even though the books are free, people express reluctance to take them, the Book Fairies have tweeted and commented before about people’s hesitancy to take books. I had planned to take photos outside of all the tube stations which I visited. Unfortunately, continuous rain put paid to that idea, I had to be content with indoor shots. It will be interesting to see if the exercise prompts any additional sales. I have certainly gained more Twitter followers, though that wasn’t really the point. I also enjoyed joining in with my fellow writers’ tweeting, of my book as well as their own. It was great fun to do. It really is a thrill to watch as commuters and other tube users find a book, pick it up, flick through it and in every case I saw ( though there were only three in my part of London ) take it away with them. I hope there are lots of happy readers out there, vicariously experiencing 13th century Al Andalus. This entry was posted in London, Publications and tagged London, Writing & publishing by juliej. Bookmark the permalink.